Saltillo Main Street has completely revamped since joining the Mississippi Main Street Association in 2016. After joining the Main Street community, all of the downtown buildings were donated and purchased to redesign the downtown vibe to create a more prosperous feel for the downtown area. 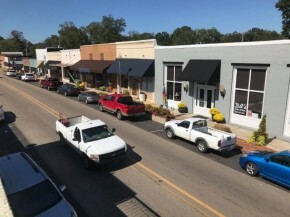 Since joining the Mississippi Main Street Association, many businesses have expanded, and people from outside Saltillo have showed interest in buying property in the area. Property owners are interested in expansions and renovations to their existing properties as well. Saltillo’s Main Street, also known as Mobile Street, has many projects in the works. One of which is to purchase and tear down a building in the downtown area to form a breezeway to the parking lot. This project will help to create a more fluid flow of the downtown enticing citizens and travelers alike to visit Mobile Street. Mobile Street is home to women’s boutiques, a new antique and craft store, and Kinfolks, Saltillo’s new downtown restaurant. The once vacant strip has creating a landing strip for tourism in Saltillo. With the help of the City of Saltillo, Saltillo Main Street is able to plan for the future and create a Saltillo Main Street the community will be proud of for years to come. This begins by getting the community involved. This community support has proven itself with support for local projects and attendance at Saltillo Main Street’s events. A large turn out to Saltillo’s 3rdAnnual Downtown Git-Down proved Saltillo’s community is involved in its activities. With a Pinewood Derby Race for kids and a RC Race Car competition, the event had something for everyone in the family. These community events involve the entire community, which Hines believes is very important. In the future, she would like to create a Junior Main Street program. With so many expansions in the works, Saltillo’s Main Street has proven where there’s a will there’s a way. Saltillo’s mayor, Rex Smith, has already approached the board of alderman about an exciting new project that will create a more relaxing feel for the main street area. After being a member of the Mississippi Main Street Association for two short years, their entire downtown area has created a completely different area for the community and tourists to enjoy. Stay updated on Saltillo Main Street’s current and future projects by following their social media pages or visiting their website, saltillolife.com. With so many projects in the works, you won’t want to miss out on this program’s progress!